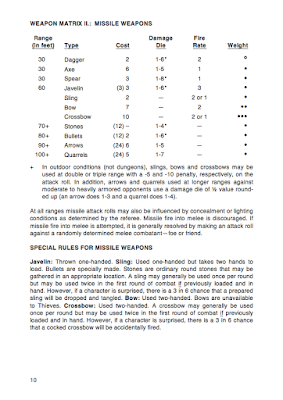 The first edition of Seven Voyages of Zylarthen features melee and missile attack tables by weapon, not class or level. Additional to-hit adjustments are then made for higher-level characters or situational factors. All weapons generally do 1-6 points of damage. I wanted to simulate how different weapons performed against different types of armor—not merely that all weapons become less effective the better the armor, but that certain weapons perform relatively better (or worse) against certain types of armor such as mail or plate. 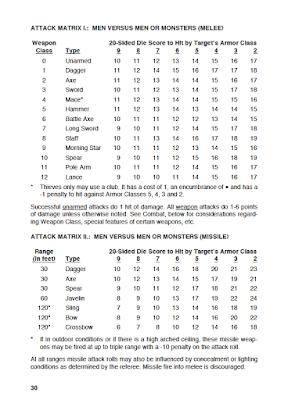 Rather than add yet another set of annoying bonuses or penalties (as was done in Greyhawk and the AD&D Players Handbook), I decided to “bake in” the effects to the main attack charts. 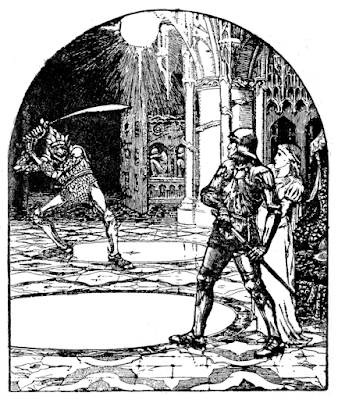 Thus, swords and pointed weapons generally have lower target numbers to hit against unarmored or lightly armored opponents but are much less effective against mail and plate (or their creature armor equivalents such as dragon scales). On the other hand, axes and heavy blunt weapons come into their own against metal armor. Another way of putting this is that the declining “curve” on the charts is flatter for axes and heavy blunt weapons. Not only did I feel that this added more realism to combat (without losing much in playability) but it also gave more meaningful choices to players in their weapon selection. No more were, say, the mace and hammer clearly inferior to the long sword. 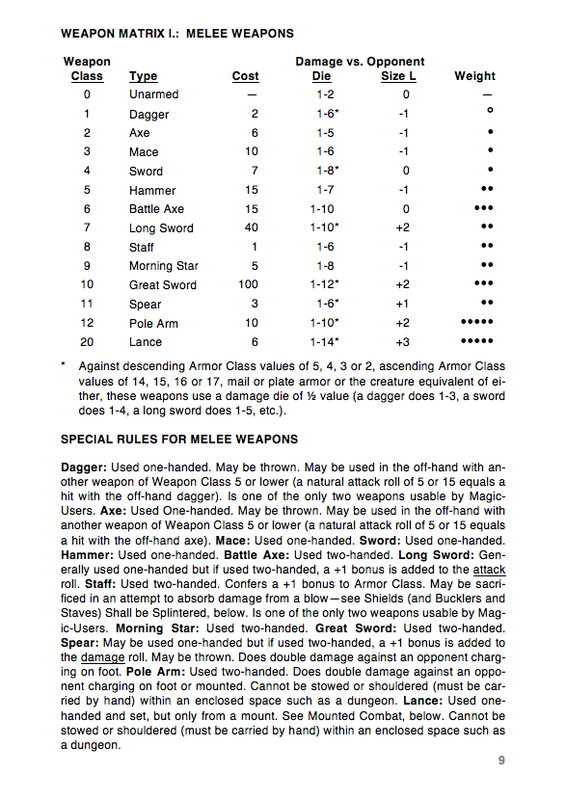 Swords might be good all-purpose weapons, but if you were going up against heavily armored humanoids or creatures with tough hide or scales, an axe, mace or morning star might be a better bet. 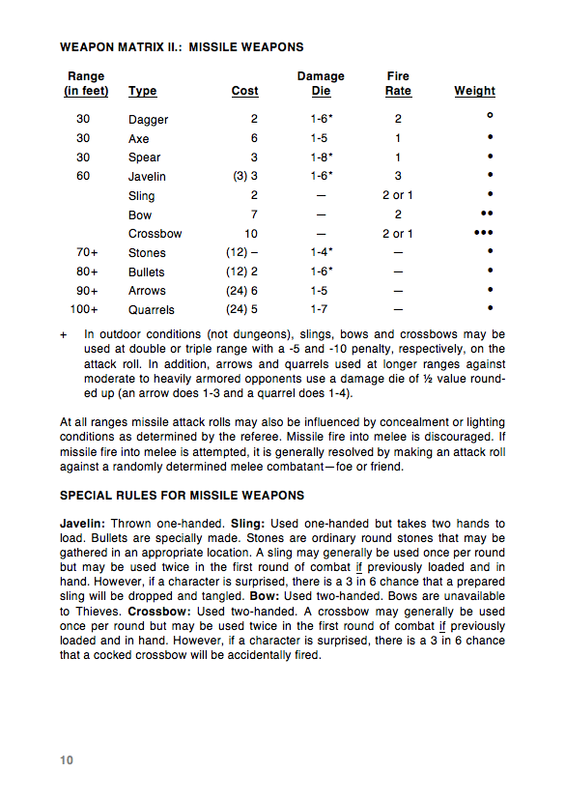 I was able to preserve the original conception of all weapons doing 1-6 points of damage - which, as a purist designing what was in some ways a hyper-purist game, I felt was important - while nevertheless including a mechanism for distinguishing between the effectiveness of different weapons. As a side-note (and this may be annoying to some), I also thought it was more OD&D-ish to base the combat mechanism around a central somewhat mysterious and (I hoped) in practice mathematically uncrackable chart (all those varying to-hit numbers). Recently, however, I have come to feel that the original Zylarthen system may have been too fiddly, as well as arguably not representing the differences between weapons with sufficient magnitude. 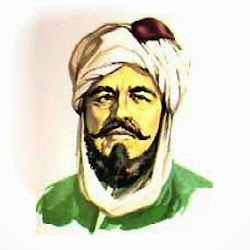 Thus, it is difficult if not impossible to memorize the charts, and the differences in the "to hit" numbers usually only amount to, say, 5% or 10% (a few pips on a twenty-sided die), which may not appear to matter as much as it should. So I devised a new alternate system. The main change is this: All weapons now have, all things being equal, the same chances to hit. Thus, for a 1st level character, the to-hit numbers follow the standard 10/11/12/13/14/15/16/17 progression against armor classes 9//8/7/6/5/4/3/2. This sequence is easily memorized. Though, in fact, if one wishes to suspend purity considerations by substituting an ascending armor class system - 10/11/12/13/14/15/16/17 - it becomes even easier to calculate, where the armor class simply becomes the chance to hit for a 1st level character. This returns the to-hit numbers to the original OD&D and AD&D scheme. What now are the most important combat differences between weapons? There are two: 1. Weapons now have differing damage dice. And 2. some weapons—most edged and pointed weapons—have their damage die halved for attacks against the better types of armor—5, 4, 3 and 2 in a descending system, 14, 15, 16 and 17 in an ascending system or, to put it non-mathematically, metal armor (mail or plate) or the equivalent in creature terms. This, for better or worse, is obviously much more OD&D Greyhawk than OD&D three little brown books. I suppose history might be repeating itself. Of course, the above aren't the only combat differences, given that other considerations from Zylarthen have been preserved: Some weapons perform better or worse against large creatures, for example. And there are still other important non-combat considerations. Cost is one of them, though cost often still has an inverse relationship with weapon durability (the “optional” weapon break rules are, in my view, an important part of the overall system). Encumbrance is another. And there are various special rules that add to (or subtract from) the value of certain weapons. OD&D purists (or, rather, hard-core purists who opposed even some of the changes in weapons and combat offered in Greyhawk) may be annoyed. But I suppose people who enjoy rolling different-sized polyhedrons for damage will presumably be pleased. I’m still basically a purist, but I’m comfortable with these changes and feel that they make for a good alternative combat system. I’m even warming up to the idea of ascending armor class . . . Here are the new charts. They should be read against the background of a few other relatively minor changes—I’ve slightly adjusted the weapon class and encumbrance for a few weapons, for example. And there is now a two-handed sword! Encumbrance: Each "dot" or unit of encumbrance is equivalent to 2-10 pounds. Most characters only get 25 to work with, with movement declining from 13 to 12 to 9 to 6 to 3 for every five units. Carrying any item with an encumbrance of 3 or more means that you can only move at a maximum of 9. And keeping in mind that you're probably also wearing armor or carrying food (or gold) or simply trying to keep your encumbrance low so you can do thiefy things or whatever, an extra "dot" or two can often make a big difference. 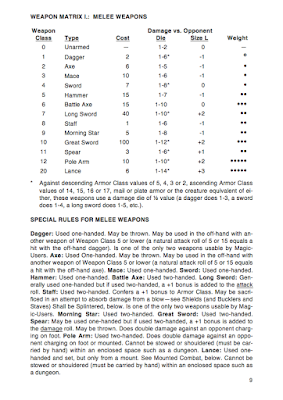 Weapon Class: Under the initiative rules, the person or creature with the highest weapon class always attacks first. Subsequent rounds feature an initiative die, with ties going to the person or creature with the lowest weapon class. This obviously gives the advantage to long weapons in short fights. For long rough and tumble melee brawls not so much. Weapon Breaks: In Zylarthen, weapons have a chance if breaking not on a fumble but on a critical hit (getting a really hard strike in may have consequences for your weapon) as well as when inflicting death blows against heavily armored or high hit dice creatures. The chance of breakage then depends on the weapon's cost (a good stand in for durability, I think) with swords and great swords having only a 1 in 20 chance of breaking, going up to 3 in 20 for daggers, spears and the like. Obviously magic weapons are largely immune. I think this makes good intuitive sense as well as tracking historical accounts of knightly duels. Often opponents would change weapons multiple times during a fight due to breakage. While things probably won't often come to that extreme in Zylarthen, dungeon explorers are well-advised to carry spares with them, especially when using cheaper weapons. But getting back to the alternate rules themselves, I feel that the changes reflect well the philosophy that no weapon is either pointless or perfect. All have advantages and disadvantages. Here is a quick summary. Dagger: A great all around utility weapon. Virtually everyone has one. It's the only weapon with no encumbrance, at least if multiples are not carried. Once in close-combat it is almost as effective as a sword. It can be used in an off-hand along with another short weapon. And in extremis it may be thrown. Axe: This weapon has many of the same advantages as a dagger as well as being a passable armor cracker. Mace: The best armor cracker for only 1 encumbrance unit. Sword: A good all-around weapon that does the highest potential damage of any of the 1 encumbrance unit weapons. It can be used with a shield, buckler or off-hand dagger or axe. Hammer: The best one-handed armor cracker. Battle Axe: The heavy two-handed axe deals out more average damage (however they are armored) of any weapon. Long Sword: The best one-handed weapon, if price is no object, for fighting an unarmored or lightly armored foe. And it performs as well as an axe against plate. Staff: We've improved this weapon a bit, giving it some of the defensive bonuses of a shield or buckler and knocking its encumbrance down from 3 to 2. Thus a Magic-User can now run at almost full-speed without having to drop it. Morning Star: Sort of a cheaper and lighter battle axe for those armor crackers who don't want to be too weighed down. Its length will also allow one to usually attack first on the first round of melee. Great Sword: I felt the game needed this. 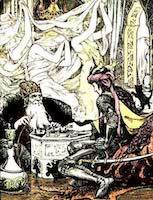 The long sword wielded with two hands didn't offer enough of an advantage. However, unlike the Fighting Man's nuke of Greyhawk and AD&D, it's encumbrance of 3 may be a negative for some players. Plus while it holds its own against heavy armor, it's not as effective in that context as a hammer, morning star or battle axe. Still, it partly make up for that by getting a +2 damage bonus against dragons and other large creatures. Spear: This cheap weapon has a number of advantages, including enabling its user to almost always attack first in the first round and doing double damage against a charge. And it's much more effective when wielded with two hands. Unfortunately, they break a lot. Pole Arm: Sort of a super spear, but perhaps too heavy to seriously consider taking on a dungeon delve. We've increased its encumbrance to 5. Lance: Nice if you have a horse. Javelins: You can take three Javelins with you at a cost of only 1 encumbrance unit, and throw them all in one round (assuming your annoyed opponent doesn't charge you). Not very effective against heavy armor, but you can't have everything. Sling: A good light missile weapon, especially for Thieves and Halflings (who get a bonus on sling attacks), and you can always try to gather stones if you run out of bullets. Bow: Not quite as effective as a crossbow, but its lighter. And it can penetrate armor at close ranges. Crossbow: The king of missile weapons. It's heavy but often worth it. I'll be officially writing up these alternate rules and offering them, along with some of the already existing combat rules and alternate "errata" for some of the encumbrance changes, etc., in a free supplement soon. It may or may not show it, but I've probably put more thought and effort into weapons and combat than any other aspect of Zylarthen. Perfection is a questing beast, but stupid or "unrealistic" weapons things bug me. This may be a fault. But to the degree that the game works, I think it does so in part due to the weapons mechanics. Or at least, for me, it does so due to the weapons mechanics. That might be a minority view among Zylarthen players and readers, but still. And of course, if one was so inclined, these weapons mechanics are easily usable, without Zylarthen, for OD&D or even AD&D. They're sort of my variation on Greyhawk. If you're interested in what I've done here, either from the point of view of being familiar with the Zylarthen rules set or not, I'd love to hear what you think. Is it an improvement? A sell out? Is there anything I overlooked? What can be tweaked or adjusted to make it better? Got to read these about a dozen times. I really like the OG feel of the original rules. But I have had players ask me why all the weapons do 1d6 damage. Your thoughtfulness about this is appreciated. Now I've got to digest.